Intel's stock price has been circling the toilet lately but I'm not so sure the company deserves the scorn of investors. In actuality, the outlook is not nearly so dismal. The nail in the coffin was when Intel announced that they were reducing their guidance for the third quarter of 2010. The stock dropped like a rock and took much of the semiconductor sector down with it. 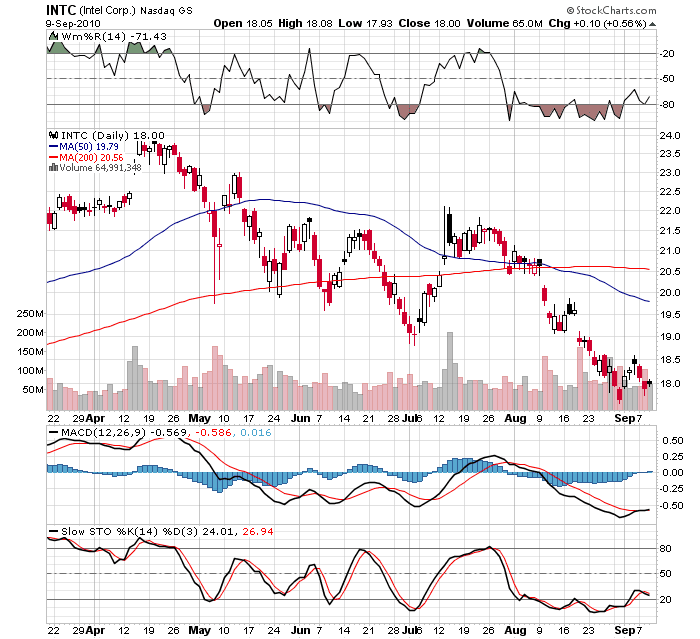 Intel has turned into a value stock. Looking at some of the classic valuation measures for Intel you would never suspect the company is a tech industry growth stock. For example, the PE is less than 11 which is very close to the 5-year low for the company, PEG is only 0.76, Enterprise Value/EBITDA is a mere 4.5 which is typically considered deep value. Intel pays a dividend. This is not particularly common among tech companies. What is also interesting about this is that the 5-year dividend growth rate is over 28%, much higher than the industry or the sector. Growth may not be double-digit but then Intel is a large company and growth is harder to come by when earnings are measured in billions of dollars. Though the outlook for Q3 is not quite so bright, neither is it a disaster. CEO Paul Otellini was quoted in the Wall Street Journal saying that at the midpoint of the new guidance range, it is equivalent to roughly $11 billion which would be Intel's best Q3 ever. Visibility for Q4 is still indeterminate but so far the company is expecting unit sales growth of 17% or 18%. This is down from an earlier estimate of 20% but, all in all according to Otellini, 2010 could be Intel's best year ever or close to it. The company is diversifying its sources of revenue. Intel has announced several acquisitions in the last month or so. None of the acquisitions are in the PC microprocessor space. The biggest acquisition is McAfee, the software company that produces anti-virus software for consumers and the enterprise. Though Intel expects to eventually be able to apply McAfee's technology to Internet devices and phones, there is no doubt that McAfee will continue to sell its software through all the current channels. Intel is buying a unit of Texas Instruments that makes cable-modem chips and, more notably, Intel is buying the wireless chip business from Germany's Infineon Technologies. The Infineon deal has clear ramifications that allow Intel to achieve design wins even if it's processors are not selected. Make no mistake, however, Intel intends to provide all the basic chips necessary for a cell phone, especially the higher margin smart phones. Intel is also teaming with Google to supply chips to the new Google TV. In summary, Intel is aggressively working to diversify. This will tend to smooth the effects of the PC boom-and-bust cycle and also allow Intel to grow into new sectors. These four reasons make Intel an attractive candidate. Perhaps the near term holds some uncertainty but the company is positioning itself for growth. A year from now, this may have turned out to have been an excellent buying opportunity for Intel investors.